Films based on Marvel properties occupy various levels of quality (to say the very least). Two thirds of X2 is amazing and Spiderman as a franchise was only as good as its special effects (Irony). Iron Man seemingly reversed this trend of rushing an inferior product to market. Yet, this film does not hold up on repeated viewings and its sequel was one of the worst films I saw in 2010. Should the superhero or comic genre fail to be a box office draw, the proliferation of Marvel properties will be the reason. 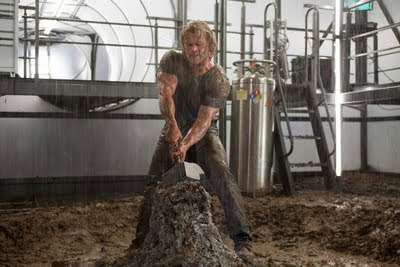 With that said, I was looking forward to Thor. My belief was that the presence of Kenneth Branagh in the project and his direction of Shakespeare's plays (on film) would impact the quality. 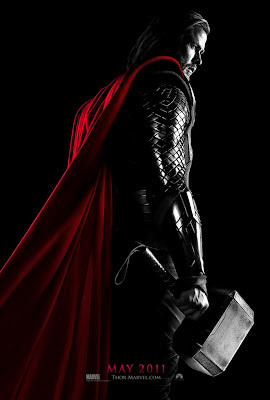 With that said, is Thor on the level of Batman Begins..? No. Nor does it enter the same pantheon of cinema that the Dark Knight occupies. Thor is one of the better films to be released that is based on a Marvel property. From my perspective, the film worked best when it was set in Asgard. When dealing with the human cast and events on Earth, the film drags, the dialogue was dumbed down and the quality of acting is not the same as the more "stage" direction approach to Asgard. Chris Hemsworth, Anthony Hopkins, Tom Hiddleston were solid, Stellan Skarsgard was wasted and Natalie Portman further shows why I do not believe she is worthy of being known as an "Oscar winning actress." Yet, the movie is never allowed to become its own entity because it is serving as a launchpad for the Avengers. I mean seriously, the Hawkeye cameo was superfluous and the closer we get to 2012 the less interested in that film (Good Luck, Joss). Especially since these films do not act to formulate the plot for that film (since the exposition of that film will do that) or introduce the various characters to each other but simply act as a cash grab. Thor is a far from perfect film but on an initial viewing, it surpasses such drivel as X-Men Origins: Wolverine, X3 and Iron Man 2. Personally, would have liked to spend more time on Asgard and less time with Portman and company. Since word on the street is that there will be a Thor sequel, hopefully it will play to its strengths. Hint: Avoid scenes with the "Destroyer" and anything involving Earth... They did nothing to elicit emotion on the part of the audience or seem particularly relevant. So, Thor spends three days on Earth, gets punched in the noodle and suddenly is a changed man. That seems convenient. Issues with the plot, the acting (Portman) and special effects aside, Thor is a decent enough film. I did not leave it with the desire to inflict physical harm on myself like I did with Iron Man 2 or X-Men Origins: Wolverine, so that was a plus. However, if Marvel or rather Disney wants to continue to make money off of their superheroes, they need to be more calculated about what is to be released and improve the quality of them as well. Otherwise, they could bring down the entire genre (Please note that I am optimistic about X-Men: First Class). Movie Night #11 Writing is hell.